From age of 6 upwards. For 2–4 players. Felt pitch 79 x 47 cm, with 2 wooden rails. 2 metal players, 2 plastic goalkeepers, one of each painted red-and-white and one yellow-and-black. 2 goal nets, 2 footballs. In a tin box. 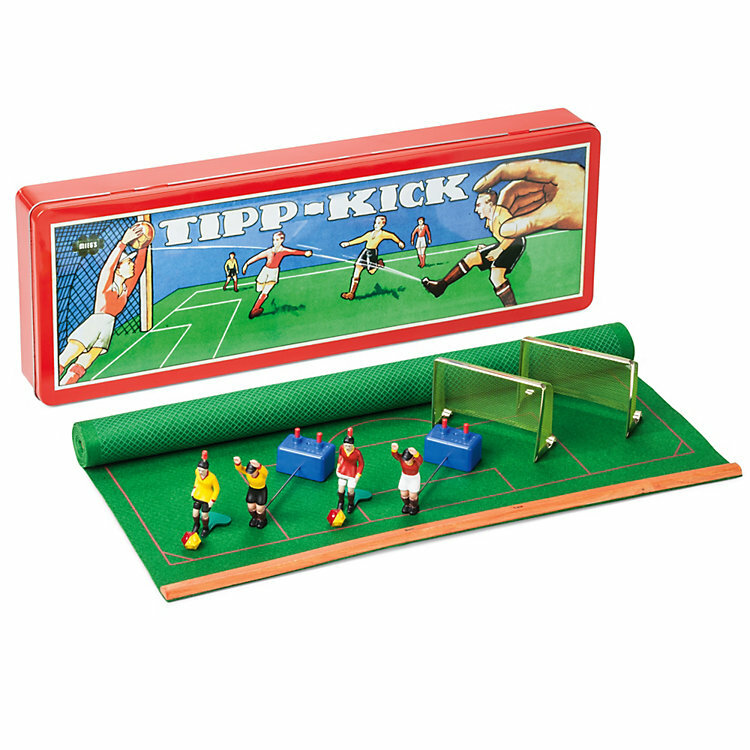 The field players – originally made of tin, later of lead and today of zinc – in the Tipp-Kick tabletop football game created in 1924 by Carl Meyer in Stuttgart have a moveable suspended leg which kicks the ball upon activation of a lever by pressing a button. The plastic goalkeepers can move to the right and left to try to stop a goal being scored. Not suitable for children under the age of 3. Risk of choking on small parts which may easily be swallowed.